This is a light, fresh side salad perfect for a hot summer day. We served it as a side with corn on the cob and veggie dogs. Tastes best with fresh tomatoes and cucumbers from the garden or market. 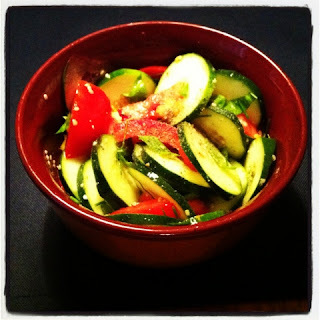 Chop cucumber, tomatoes, basil leaves, chives & garlic. Mix remaining ingredients, and pour over chopped veggies. Stir and season to your liking. Serve immediately or chilled.